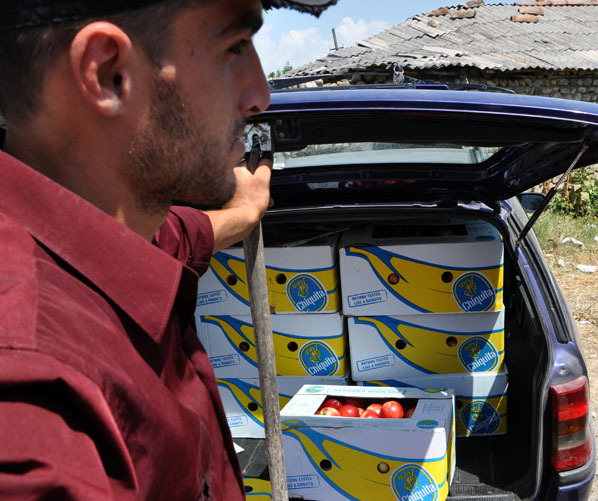 TBILISI, DFWatch–The sale of peaches is so slow in Georgia that sellers haven’t been able to cover their costs this year. They ask for more processing plants to be built. 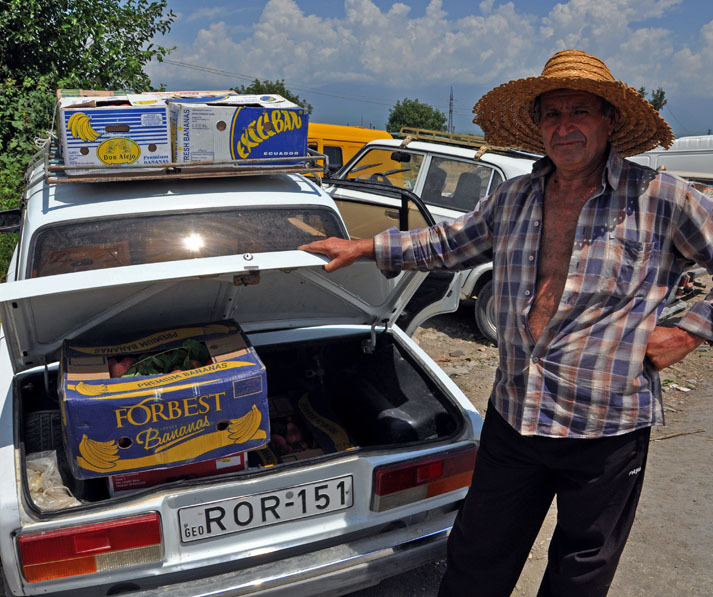 Nikoloz Gharibashvili, 62, owns peach fields and his income usually comes from selling peaches. But this year, he, like other Georgian peach sellers, is having problems selling his fruit. Nikoloz is struggling with health problems. He has survived several operations and now he often forgets things, so he explains that he has to come to the market together with his wife, who will negotiate with the buyers instead of him, but there is almost no-one there who wants to buy peaches. In Chumlaki, a village in Georgia’s western Kakheti region, there is a market where sellers from different regions bring tons of peaches and nectarines. The sellers say the problem is that customs fee to Azerbaijan, where most of the buyers come from, has increased from 0.50 to 1.20 laris (from USD 0.30 to USD 0.72) and the price of peaches has decreased from 10 to 20 tetris (USD 0.06 to 0.18) for one kilogram. Gharibashvili says that last year he also had clients from Azerbaijan and sold one kilo for 50-70 tetris (USD 0.30-0.50). He explains that he doesn’t receive pension yet, as he hasn’t reached the age limit of 65 for men in Georgia. His family doesn’t have any other income. In fall he will have to sell grapes, but he feels pessimistic about it. During our conversation one client from Azerbaijan approached NIkoloz’s car. He told us that increased clearance on customs is not beneficial for them either, because prices has increased for one kilo peach in Azerbaijan as well. It was 50-60 tetris last year, now it is 1.20 lari, he says, and leaves without buying peaches. Peach sellers say that they haven’t been able to cover the costs that they spent on harvest this year. This includes 20 laris (USD 12) for each worker for collecting the peaches, about 400 laris (USD 240) for spraying pesticides several times a year, distribution and other costs. Many of the sellers we met say they haven’t sold anything the last two days. There are no Georgian clients at all. The sellers think it would be good to build factories in Georgia to produce their own juice and lemonade. They would have clients and the country would be able to supply produce to its domestic market. The sellers spend the whole day at this place, where it’s hot, no shadow or water, waiting for their clients. They accuse local and central government for not paying attention to them. Joni Osiashvili, Gamgebeli of Gurnjaani’s municipality, explains that because there are no processing plants, it is not possible to sell the harvest, but he adds that the government is working to solve this problem. “We don’t have any alternative market today. Peaches are mainly sold to Azerbaijan,” he says, adding that the country still continues negotiations with Russia to open that market for also fruits and vegetables, in addition to wine and mineral water. Russian embargo was enforced back in 2006 for Georgian products. Osiashvili notes that the local municipality the Ministry of Agriculture about the problem, and that it has contacted Azerbaijan and asked authorities there to lower the customs fee. Negotiations are in progress, but with no results so far. The statistics of Georgia’s national Statistics department does not have data separately about peaches. The figures indicate that in 2012, Georgia exported apples, pears and quinces worth USD 257 000. A fruit group of apricots, cherries, peaches, plums and sloes was USD 837, while Georgia’s entire export in 2012 was USD 2.3 billion.